Hawaiian Islands Oahu to Niihau. 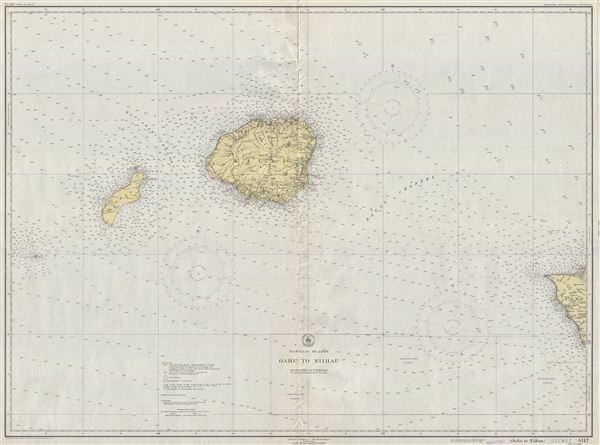 This is an uncommon 1948 nautical chart or maritime map of the Hawaiian Islands from Oahu to Niihau, including the islands of Niihau and Kauai, as well as part of Oahu. Offers some inland detail as well including topography, rivers, peaks, roads, trails and cities. Includes countless depth soundings in fathoms. The chart was prepared under the supervision of L. O. Colbert, Director, U.S. Coast and Geodetic Survey and published in Washington D.C. as coast chart no. 4117. Very good. Minor wear on original fold lines and to edges. Some minor pencil marks relating to navigation - can be erased.